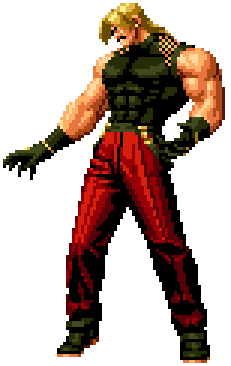 Rugal Bernstein (ルガール・バーンシュタイン) is a wealthy arms dealer who was granted a fraction of the Orochi power from Goenitz, which greatly amplified his strength. He lost his right eye in a struggle with Goenitz, but replaced it with a cybernetic orb. The details of Rugal's early life are unknown, but by the events of The King of Fighters, Rugal had become an international arms dealer, operating out of his aircraft carrier BlackNoah, accompanied by servants and his pet panther, Rodem. Rugal was not only feared in international politics, but also in the fighting world; as a vicious combatant, Rugal took his defeated foes and dipped them in liquid metal, making them into statues to commemorate his battles. Heidern, a mercenary leader, had been trying to infiltrate Rugal's operation, which prompted Rugal to kidnap his wife and daughter, daring him to try and mount a rescue. When Heidern brought an entire company of his best men to the Rugal's Carrier the Black Noah, Rugal, by himself, wiped it out to a man, and would have killed Heidern if his family had not interevened. Instead, he killed them and left Heidern with one eye and grievous injuries. Rugal later sensed a tremendous power in the middle of nowhere, and when he went to take it for himself, Goenitz appeared, took out his eye with one strike, and gave him a small portion of the power of Orochi for surviving the attack. Returning to the Black Noah, Rugal had a bionic eye implanted, and recruited two secretaries: Mature and Vice. With their help, Rugal organized a King of Fighters tournament, in order to find worthy opponents. During the invitation phase, Saisyu Kusanagi came to the Black Noah and challenged Rugal. Although Rugal won the battle, he did not subject him to his metal bath. When Saisyu's son, Kyo, arrived with his teammates, he defeated Rugal. Unwilling to accept defeat, Rugal blew up his ship. Rugal was believed dead, but he used the Orochi power to survive. Replacing his destroyed right forearm with cybernetics, Rugal revived Saisyu, brainwashed him, and sent out invitations the following year for another King of Fighters tournament. Rugal used an abandoned missile silo as his base in 1995, and abducted the winning team (again, Kyo's team) to fight Saisyu, and then himself. Despite using the Orochi power and becoming 'Omega Rugal,' Kyo's defeated him. Again beaten, Rugal tried to use more of the Orochi power, possible for Riot of the Blood, but it consumed him. As his body disintegrated, he saw Iori Yagami, who told him that only those "of the bloodline" could control Orochi's power. This page was last edited on 27 January 2009, at 21:55.